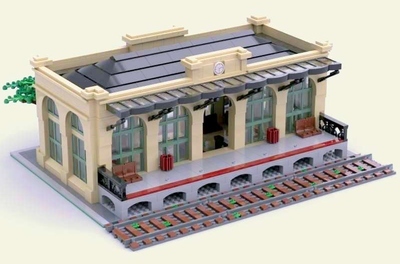 Welcome to Stanley's Books- a multi-level modular that I have created to fit in with current modular sets. This modular has approximately 1352 pieces and I have included 9 minifigures throughout the building. 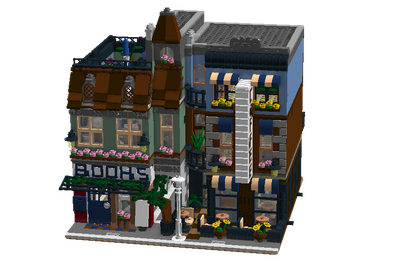 I have been inspired to build this modular because of my love of reading and the important role bookstores play in the community. Bookstores are often community hubs and meeting places, offering a place to read, socialise, educate and entertain people of all ages and cultures. 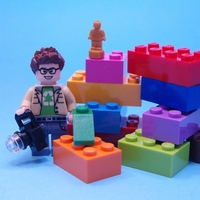 I feel this fits into the Lego framework and culture of the company. 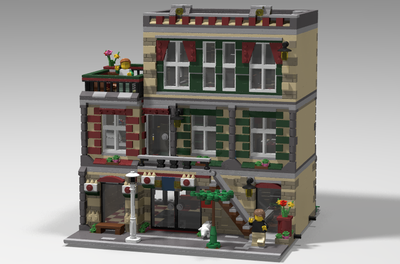 When putting together this modular my design inspiration was the New York style of brownstone buildings- brick, ironwork, a flat roof, lower basements and built quite close to the street with subtle architectural detailing on the facade. In keeping with this style of building, the front entrance is quite close to the sidewalk, with a small green space and glimpses to the lower basement. As these brownstones were generally built in rows of townhouses this modular lends itself very well to further expansions, a streetscape, a neighbourhood, or even your own Lego version of New York City. This modular is 16 studs wide by 32 studs deep and has the standard modular connection points to add to your existing modulars. The front half of the bookstore opens out via hinges for extended playability and exploration. It has a lower basement level that is hinted at with visible exterior windows and some small details that can be seen once the bookstore is opened out. Each additional level can be removed for further play. The first level of the bookstore contains the cashiers counter, numerous bookshelves filled with books, a newspaper stand by the door and a very cool rotating magazine rack in the front window. There are plenty of fun details and elements throughout this level. Continuing up to the next level via the staircase you will find a lovely stained glass window feature, artwork on the walls and a hidden pull down ladder to access the roof. On this level there are numerous bookshelves and a table with minifigures attending a book club. Again on this level there are lots of areas to explore and interact with. The final level, the roof can be accessed via the pull down roof ladder and the roof hatch. I have include a minifigure on the roof, having a quiet coffee and a read. I hope that Stanley's Bookstore conveys a story in each level; the small details in each level add to the playability and creativity of the set. The reason I have named this modular Stanley's Books is in honor of my cat Stanley, who was my supervisor and "assistant builder" during the initial construction of the bookstore. If you like this modular please hit Support and Follow. I'd also love to hear your feedback on the building. Thank you for considering my Project!